Take a look at the projects we've completed. Take a look at the small bathrooms we've completed. Take a look at the large bathrooms we've completed. We're flattered to have such creative, ambitious and kind customers. The feedback below is directly from our customers collected through Checkatrade.com, an independant feedback service. Clean, reliable and professional tradesmen. Couldn't fault him. Very happy with the job which he done. Emperor Bathrooms took pride in their work and the finish was to an extremely high standard. So much so that my father in law is now asking for two new bathrooms and downstairs loo too! Brilliant, 5 stars. Gave great customer service. My wife and I are delighted, they have changed my wife's quality of life. Made us feel good and they were so helpful. Emperor Bathrooms know their stuff and it is a pleasure to have work done by them. Definitely would recommend Emperor Bathrooms. Great job done, we love our new Bathroom. Thanks to Emperor Bathrooms for doing this for us. I would highly recommend them to friends and family for any future works. Our team have been designing and installing bathrooms for over a decade. Trust us to help you design and install the bathroom of your dreams. An excellent experience from beginning to end. Emperor Bathrooms clearly takes pride in their work and the final bathroom has been fitted to a very high standard. They were punctual, friendly, and always kept things tidy. They were happy to give advice on the best way to do things and was flexible in their approach when we hit any snags which were out of their control. I would certainly use them again in the future. The work was carried out promptly and of a very high standard, the parts are all high quality and the team allowed me to make an informed decision on the type of pump giving unbiased consultation prior to the work commencing. We needed to transform our bathroom. Our changing needs meant that a bath was no longer practical and we wanted it replaced with a large shower unit. Emperor Bathrooms provided sound advice on how best this could be achieved. The team were pleasant, thorough and worked hard to get the job done. We are delighted with the results. We don't just create bathrooms. We strive for perfection in everything we touch. Our bathrooms provide our clients with a cosey space to relax in after a hard days work in the office. Extremely reliable team. Worked on our bathroom and completed it ahead of schedule. I'd recommend these guys to everyone. 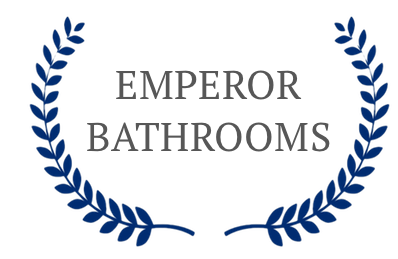 From the moment we had our initial design consultation, the Emperor Bathroom team have been nothing but considerate, reliable and hard-working. I'd use Emperor Bathrooms again in a flash. They helped us choose the right design for our small bathroom and even reduced the cost of our bathroom accessories so it cost us less than we expected. We'll design your bathroom to a high specification, choosing accessories from trusted known brands and install it all within budget and on time.